I know this has been around for a bit now, but I’ve never tested it out. Wow, thank you Firefox! 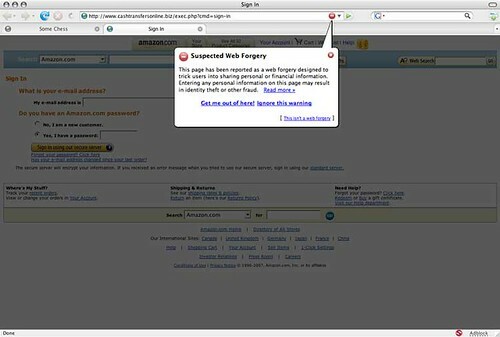 Though I wonder how many of the people using Firefox actually fall for phishing. My guess is the Internet Explorer users are the prime targets, since they tend to be a bit less web savy. Now if only IE7 could do that without Microsoft screwing it up. Though I am glad to see that they at least have something to protect people from digital con-men and con-women.